I’ve been to an author festival and school book fairs, but never to a trade show. This past weekend, my publishing team and I made the trek to Daytona Beach for the Southern Independent Booksellers Alliance (SIBA) annual trade show. Holy cow! What fun!!!! We had no idea what we were getting into. We realized before even going that we should have had a booth. See, the publishers have the booths and the indie store owners do the browsing. Probably should have been obvious, but we just didn’t know. Besides, by the time we joined SIBA, it was too late anyway. So this was entirely a learning experience. We romped the show floor, hung out in the lobby and bar and met lots of people and made some great contacts. And now we know what to do next time. Yes, there will definitely be a next time. I handed out a few copies of Promise and lots of literature. Hopefully some of these indies will be selling Promise soon. Saturday’s haul by all three of us. We added nearly this much on Sunday. 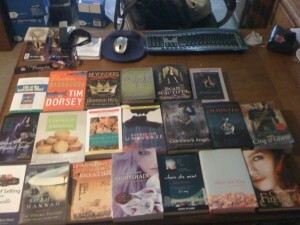 My own personal loot…spread out…and not including tote bags and other fun items. 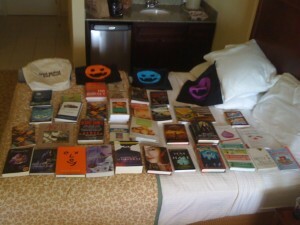 Yes, those are Nightshade and Across the Universe ARCs!!! 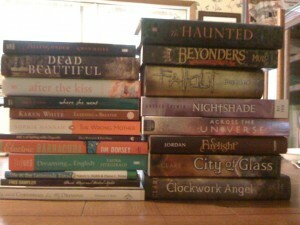 And many more I can’t wait to delve into! All stacked up…except for the book I brought home for The Man, which he’s already reading in the other room. I’ve never been to a book show, but it sounds like so much fun. I would have brought home a ton of books too! Happy reading! How exciting! I bet you had fun despite not knowing. Yes, it will be better next time! I wish I had all those books! Have fun reviewing them!